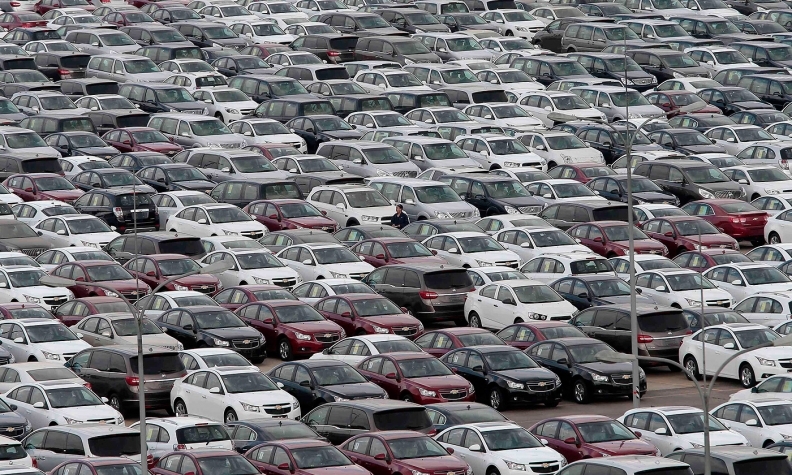 General Motors' Chinese-made cars at a parking lot in Shenyang, Liaoning province in April 2014. The drop in consumer demand has prompted GM, VW and other automakers to cut China prices, threatening profit margins. TOKYO (Reuters) -- The head of Japan's auto lobby said on Thursday that China's economic situation looked tough and that he could not be optimistic about the outlook for the country's auto market. Fumihiko Ike, chairman of the Japan Automobile Manufacturers Association, said China’s vehicle market has shown signs of a “downward spiral” that will eventually hit Japanese carmakers. “There’s excessive competition and carmakers are building excessive capacity, and to raise utilization of the plants, they will engage in excessive selling,” Ike said. Ike, who is also chairman of Honda Motor Co., made the comment at a regular news conference. Japanese automakers are coming off a record first-half in China, cementing a comeback from anti-Japanese protests in 2012, even as competitors like Volkswagen AG and Hyundai Motor Co. posted sales declines. The gains at Japanese automakers are a bright spot in the world’s largest car market, which is headed for the slowest expansion in four years as economic growth moderates and cities cap vehicle registrations. The slump in demand has prompted General Motors, VW and other automakers to cut prices, threatening profit margins. The average level of capacity utilization across international auto brands has fallen to 94.3 percent in the first half of this year, dropping significantly below 100 percent, according to Sanford C. Bernstein analysts led by Robin Zhu. Foreign carmakers will have to cope with lower utilization rates in future, they said. Japanese car brands reached a combined market share of 20 percent in China as of May, matching levels seen before 2012, when political tensions escalated over a territorial dispute, according to researcher LMC Automotive.